A long, long time ago this tree (next to the water) had a boat (or something) chained to it. 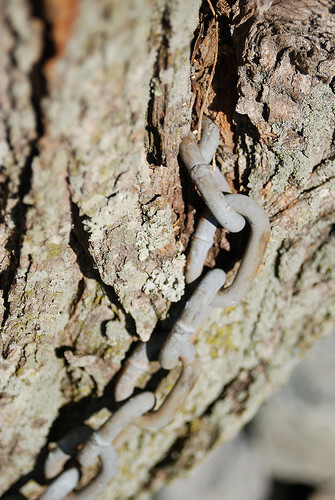 Someone forgot the chain and years later it became part of the tree, running straight through the trunk front and back. I'm totally fascinated by the tree and the chain (and all the metaphors you could come up with regarding their relationship). This is the tree where we were married - an appropriate Forgotten Friday end to wedding week, no? Does that chain have any symbolism attached? Great shot. Ashley - haha - well there is no "ball and chain"...I suppose if you are going for symbolism you could talk about how they are both strong in different ways, or how they have grown together but no, there is no "real" symbolism. I'm looking forward to getting home so I can play with the images a bit - this was a direct import - I have a feeling some of them will be really interesting!